This module describes DNA size variant (SSR/microsatellite) analysis using infrared detection. Screenshots of sample genotypic data are provided. As an example of an instrument using capillary electrophoresis for fragment analysis, we discuss the Beckman CEQ8800. 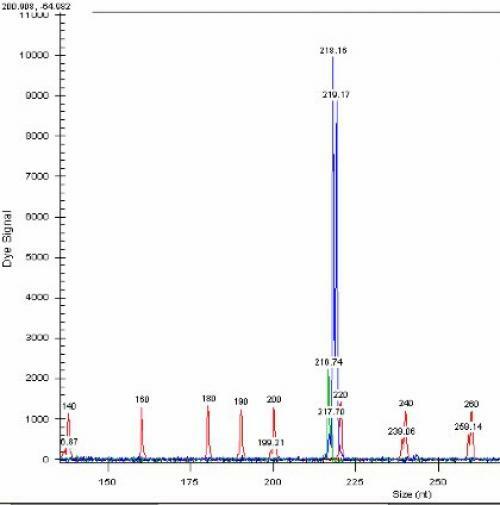 The CEQ8800 is an 8-capillary instrument with nonproprietary software for DNA sequencing, SSR (Simple Sequence Repeat), and AFLP (Amplified Fragment Length Polymorphism) fingerprinting. The CEQ8800 has diode lasers that excite infrared (IR) dyes, and has four detection channels. For fragment analysis, alleles in each sample can be labeled using PCR (Polymerase Chain Reaction) amplification with primers that are tagged with a dye that can be assayed using IR light detectors. Four IR dyes are used, three separate dyes for multiplexing, and the fourth dye is used for the size standard. Genotyping data are analyzed with the CEQ8800 Series Fragment Analysis Software that estimates DNA fragment sizes and amounts and identifies alleles represented by specific DNA fragments. Figure 1. Beckman CEQ8800 output for one capillary. The y axis shows the dye signal output and the x axis shows the fragment size. The red dye is the size marker, while the blue and green dyes are attached to PCR products. This capillary is separating three fragments; one at 219 bases, one at 217 bases, and one at 216 bases. Screenshot credit: David Francis, The Ohio State University. Figure 2. Spreadsheet of the list of fragments detected using the Beckman CEQ8800. 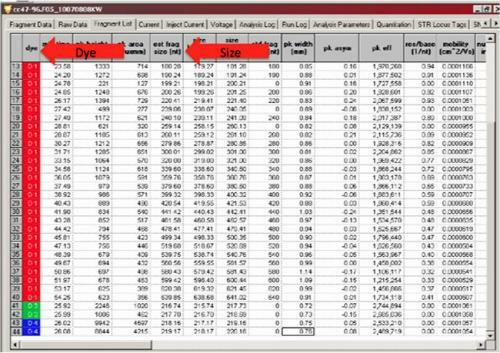 The spreadsheet includes the IR dye and the fragment size (shown with arrows), as well as peak height and width. Screenshot credit: David Francis, The Ohio State University. An example of a gel-based fragment analysis system is the LICOR IR2 DNA analyzer. Also developed as a sequencer, the IR2 uses a polyacrylamide slab-gel to separate fragments based on size. Detection is based on IR dyes, with two dyes available (700 nm and 800 nm channels). Primers are synthesized directly with the label, or indirectly using an M13 tail—an additional 20–25 bp oligo derived from M13 phage sequence that is added to locus-specific primers and does not bind to plant DNA. Complementary primers to the M13 tail are labeled with IR dyes to detect specific amplified alleles. The LICOR separates fragments on a traditional slab polyacrylamide gel, detects the IR signal, and then creates a 'pseudo gel image' for display (Fig. 3). Figure 3. A series of pseudo gel images from the LiCOR IR2. (A) a simple bi-allelic pattern that is easy to interpret and score. (B) a more complex pattern that is difficult to interpret in terms of alleles. Image Credit: David Francis, The Ohio State University. In the pseudo gel images, each lane represents a single individual. Small fragments travel through the polyacrylamide gel faster than large fragments. The LICOR IR2 allows the loading of 64 individuals (including size markers) with one sample per lane. Markers may be multiplexed based on size and on the IR 700 or IR 800 dyes. Thus a single gel can be used to score multiple markers. Scoring fragments is easy when patterns are simple and/or when segregation data is available that allows allele assignment. However for multi-allelic patterns, scoring can be more difficult. In these cases it is important to keep in mind that assays are for phenotypes that we are trying to interpret as genotype. The banding pattern in gel (B) may be best scored as a phenotype or fingerprint.